Get ready to enjoy the awesome activities this camp has to offer: climbing, epic slides, horseback riding, marksmanship, waterfront fun and campfires! Pack 24 has reserved a total of 56 spots for Friday, April 26-April 28. Camp Tecumseh is in Brookston, Indiana which is north of Lafayette and approximately a two-hour drive from the Riverside area. Camp Tecumseh is one hour ahead of Riverside, so please plan your travel accordingly. Registration is currently open ONLY for Scouts. Sibling registration will open if space is available. Our accommodations will be four bunkhouse style cabins, which will each sleep 14 individuals. Each will have indoor plumbing, showers and heat. Each bunk bed has an electric outlet and a shelf for personal belongings. We will group everyone by family. We will have a Father’s Cabin, Mother’s Cabin & Family Cabin! Each family will have the option to stay either two nights (Friday & Saturday) or just for Saturday. Everyone has to check out by 1pm ET on Sunday. For the two night option, check-in on Friday is after 4:30pm ET and includes four meals beginning with breakfast on Saturday. The cost is $70 for adults and $60 for kids (scouts & school-aged siblings). Note – there are no activities or food available on Friday night. You may want to pack a picnic, and bring some games. 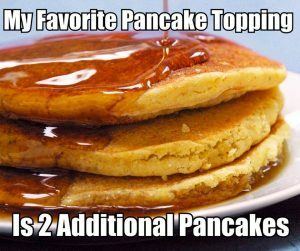 For the one night option, check in is Saturday morning after 9am ET and includes three meals beginning with lunch on Saturday. The cost is $55 for adults and $45 for kids (scouts & school-aged siblings). 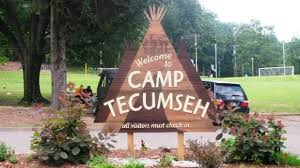 If you have not been to Tecumseh and are trying to decide between one night or two nights, we would recommend arriving on Friday night ONLY IF you are able to get to the camp before 9:00 pm EST (Tecumseh is one hour ahead of Chicago and the registration desk closes early). It is hard to find the camp in the dark, and even harder to find your cabin if you miss registration and are unfamiliar with the camp. If you are unable to reach Tecumseh by 8:00 pm CST/9:00 pm EST – we recommend you only sign-up for Saturday and arrive early Saturday morning. There will be no Pack 24 representative at the camp to help you find your way on Friday night if you arrive at 9:00 pm CST. There is an extra fee for horseback riding ($9 for a 40 minute trail ride), the rifle range ($1 for ten shots), or candle making ($2 per person). You can only register for these activities in-person, when arrive at the Camp. There is not a set of scheduled activities for our group, so people can choose to spend their time at the waterfront, climbing, sliding or doing whatever is the most fun. 7:00 am Rise & Shine! 7:30 pm Campfire – Join us for songs, skits, & stories led by camp staff. It goes without saying that all the scouts that participate in this event will receive a commemorative patch. If you’re ready to for this adventure, then register below. Due to limited space, registration is first open to Scouts and parents. If all spaces aren’t filled, we’ll open spaces up to siblings on April 5th. Registration will close on April 15th. 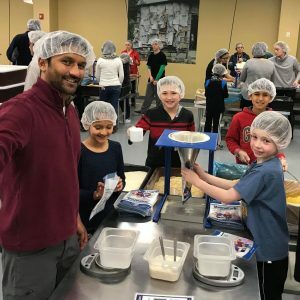 Sign up here to join Pack 24 at Feed My Starving Children! Give just a couple of hours of your Saturday and you’ll help feed 30 children for an entire year. Plus, there’s still time left in the day to go out as a family and feed yourselves! It’s a win-win! This event is open to ages 5 and up and is a wonderful way for the whole family to serve those in need and have a lot of fun while bonding with the Pack. Once you register yourself, you can add the name of your Scout(s), siblings, grandparents, friends, etc. by clicking “add member names”. The more the merrier! Feed my Starving Children always makes sure this event is fun and lighthearted. Plus, the Scouts not only LOVE having a job to do, they can feel good about doing it. Hello, Pack 24 families. See below for info regarding two upcoming events: Feed my Starving Children and Snow Tubing at Wilmot! 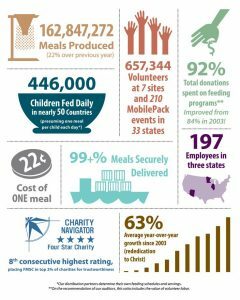 Pack 24 has an amazing opportunity to volunteer with the Feed my Starving Children organization! We’ll be packing nutrient-dense meals to be distributed to malnourished children all around the world—nearly 70 countries, including the United States after Hurricane Katrina. 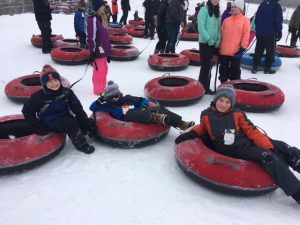 Get ready for some some snow tubing fun! Join us on Monday, January 21st from 10AM-12PM for snow tubing at Wilmot Mountain. Monday, January 21st is MLK day and a student non-attendance day for all District 96 schools- what a great way to spend a day off! Wilmot Mountain is about 1.5 hours from Riverside and was just recently renovated. Check out their website: http://www.wilmotmountain.com/ We will meet at the Snow Tubing Lodge at about 9:45AM to sign waivers and hand out tickets. The Scouts had such a successful popcorn campaign this year that this event is FREE for all Scout and discounted to $15 per adult and $10 per sibling. Paypal is strongly preferred but you can pay by check by dropping it off at 92 Riverside Rd. Please email me at ciminokl@comcast.net with any questions. See you on the hill! 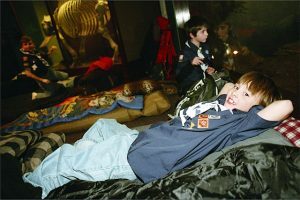 It’s time to Doze with the Dinos at the Field Museum: Friday, February 8th-Saturday February 9th! Come enjoy a REAL night at the Field Museum with Pack 24. Many exhibits are open until midnight and there’s TONS to explore. It’s been a while since Pack 24 has done this overnight and we’re not sure when it’ll come around again, so take advantage of this opportunity while you can! Cost is $65 per person and includes access to Dozin’ with the Dinos overnight and all open museum exhibits, parking, evening snack, continental breakfast and admission to the museum the next day. Note: parking is not included for the next day admission. Guests can also enjoy a screening of “Waking the T. rex: The Story of SUE”. Tickets are $5 and sold on the night of the event. The Pack has reserved 45 spots. If these spots are not filled by Scouts and adults, we’ll open reservations to siblings one week before the January 2nd registration deadline. We understand that some of our events, such as museum overnights, cost a little more. If you would like to attend with your Scout, but find the cost exceedingly prohibitive, please email Kim Cimino (ciminokl@comcast.net) and the Pack will try to work something out. We want everyone to be able to join in the fun! Check out the details then sign up at the bottom. Deadline is January 2nd! Check in is from 5:30-6:15pm at the south entrance of the museum, opposite from the Shed Aquarium. All guests must be checked in by 6:15. Please eat dinner before you come! Outside food is not allowed, although there are vending machines. If you arrive late, you can enter through the South Entrance until 8pm. Guests that arrive after 8pm must enter through the West Entrance, near Lake Shore Drive. No one will be admitted to the museum after 9pm. Overnight parking in the Soldier Field North Garage beginning at 5pm is included with your ticket. You can access this garage off 18th street. Take a parking ticket from the machine and a validation ticket from Dozin’ with the Dinos check-in staff. All cars in the garage must exit by 9am the following morning. Do not park in the East Lot, unless you’ve made prior arrangements for accessible parking. Pack carefully! We do not provide any sleeping equipment. Guests are strongly advised against bringing wagons or other heavy equipment. Chaperones are not allowed to drop off their children or overnight gear at the entrance and leave them unsupervised while parking. Pack and clear your supplies by 8:30am the next morning. Move your car out of the North Garage by 9am. If you need to leave before 8am, exit through the East Entrance 11 on the ground floor. To depart before 6am, contact a Dozin’ with the Dinos staff member or Protection Services Officer. Continue exploring the Museum after the event ends—Basic admission is included with your ticket! You can leave your gear with coat check or pack it away in your car. Just remember to have a Dozin’ with the Dinos staff member stamp your hand so that you can re-enter the Museum. If you are staying on Museum Campus, you can pull back into the North Garage and pay the daily rate or drive closer to the Adler Planetarium to find a metered parking spot. Our last Pack meeting of the year is Tuesday, December 11th at 7pm! This is the night that Scouts who have sold over $500 worth of popcorn get to choose an adult to give a pie in the face. It’s tons of fun whether you participate or just watch from the sidelines. Plus, we’ll be handing out popcorn prizes to the popcorn-selling Scouts. 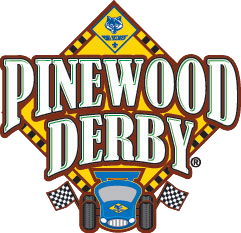 Also on the agenda—each Scout will get their Pinewood Derby car to work on for January’s race. The Scout Shop in Lagrange will have their first free cutting event this Saturday, December 15th where Scouts can choose from several templates and have their cars cut for free. We’ll have more info on the Derby at the Pack meeting and will be sending out official rules later this week. This is our last Pack meeting until March. 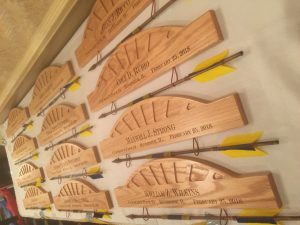 In January, we’ll have the Pinewood Derby and February the Blue & Gold banquet. There are other events planned for the next couple of months, too, like the Feed My Starving Children service event, Dozin’ with the Dinos, Wilmot Tubing and Pancake Breakfast, so make sure to open and read all Pack 24 emails so you don’t miss out! Our monthly Pack meeting is Tuesday November 13th at 7:00PM at RPC. 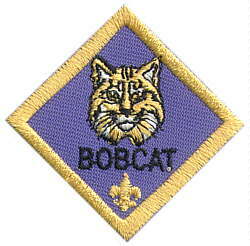 This month is our Bobcat ceremony where we recognize our new Scouts and their first achievement. We will start downstairs in the social hall for any announcements and then will move upstairs into the Sanctuary for the ceremony — Lions, then Tigers, Wolves and so on. Parents follow behind. New Scouts are called up to the front and then their parents to join them. The parents are handed a Bobcat badge and pin. Once the Den Leaders are done speaking, usually people take pictures for a few minutes. After the ceremony, we’ll head back downstairs for refreshments. All Scouts should be dressed in full Class A uniform, scarf and slide included. The requirements for earning the Bobcat Badge are found in the Cub Scout handbook, but here is a recap. We know it takes a while to learn all of these things, so please just tell your Scout(s) to do their best. Note: new Scouts will recite these as a group, so no need for nerves about any solo performance. This is the basic information that all Cub Scouts must know which is why all Scouts must earn the Bobcat badge before any other badge. P.S. 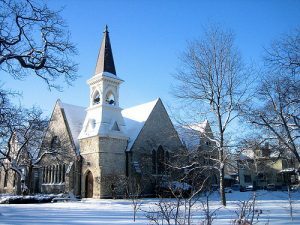 : Please remember that we are guests in the church and to treat the church, especially the Sanctuary, with reverence. No running and use inside voices when traveling to and from the Sanctuary.